A region-wide greenhouse gas inventory data consistent with the Global Protocol for Community-Scale Greenhouse Gas Emission Inventories (GPC) updated annually. *Includes targets that have already been adopted. This commitment includes the following target types: base year emissions goals, fixed-level goals, base year intensity goals, and baseline scenario goals. To develop a region-wide GHG inventory consistent with the Global Protocol for Community-Scale Greenhouse Gas Emission Inventories (GPC) within two years, and submit existing data to the carbonn® Climate Registry (www.carbonn.org). 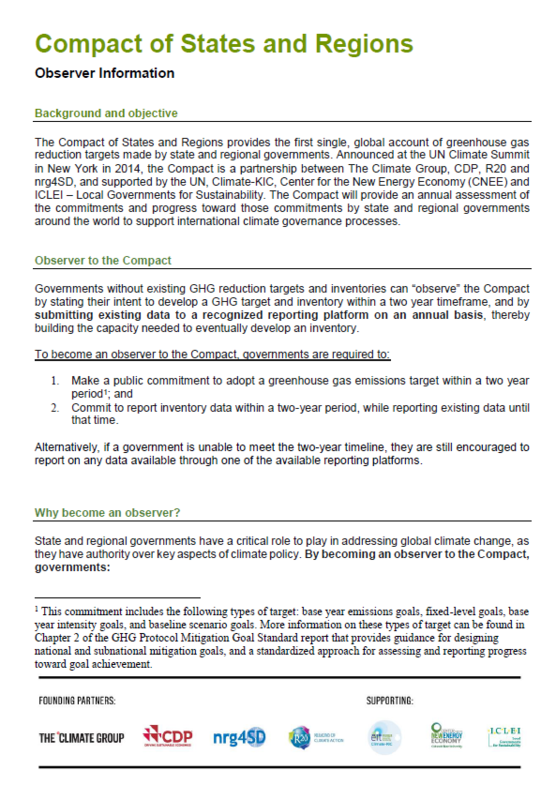 Annual disclosure reports will be compiled and published by the Climate Group with support from CDP's States and Regions platform, the Compact's central repository platform.